Place chicken, celery, carrots, onions, salt and pepper and 4 cups water in a stock pot on low heat. You can also use a slow cooker set to low. Cover and cook on low heat for 8 to 10 hours. Remove chicken and vegetables with a slotted spoon. Strain and clarify stock; remove fat as desired. 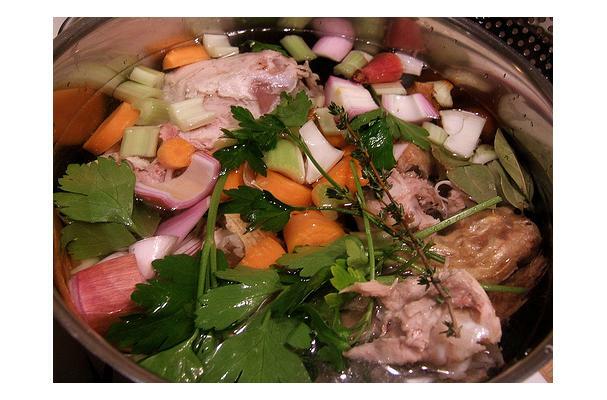 He is my simple 3 minute take on chicken stock...no muss...no fuss...great results. I am wondering why you bother to cut up the vegetables. I put them in whole or broken in half. Seems to work fine evey time, but maybe I am missing something I hadn't considered.